Maputo — The Aga Khan Foundation is to build a new education academy in the city of Matola in southern Mozambique at a cost of 50 million US dollars. The academy will have the facilities to accommodate 400 students from first to twelfth grade. The project was announced by Education Minister Zeferino Martins on Friday in Maputo, shortly after his arrival home from a working visit to Kenya. Martins noted that "the education academy will focus on teaching talented young entrepreneurs, concentrating on entrepreneurial values, leadership and knowledge. This institution will be open to students from low, middle and high income families. However, destitute students or those with few resources will be admitted on special criteria yet to be defined". The academy will follow the curriculum of the International Baccalaureate. Martins was in Kenya at the invitation of the Aga Khan Foundation. During his visit he made a tour of an Aga Khan education academy with similar features to those that will be built in Matola. Lee Davis, Aga Khan Academy, Maputo to present at the British Educational Training and Technology Show, 2012Lee currently oversees curriculum and master planning for the Aga Khan Academy, due to open in 2013. Lee also has responsibility for developing an ICT strategy for the Academies network as a whole, which ultimately aims to connect teachers and learners together across 18 Academies located in some of the most challenging environments in the world. Prior to joining the Aga Khan Academies, Lee was Head of Online Professional Learning at the International Baccalaureate (IB) where he led the development of online workshops for teachers worldwide, using the Drupal and Moodle platforms, as well as the creation of innovative teacher support services using wiki-based technologies, social networking tools and the IB’s own Online Curriculum Centre. Lee has extensive school leadership experience in an international context and is passionate about embedding ICTs into teaching and learning experiences. Today marked the beginning of the construction process of the Aga Khan Academy, Maputo. Site clearing work began in preparation for construction. Casais Engenharia e Construção, one of the largest Portuguese contractors, which has been in existence for over five decades, was awarded the contract for this first phase. Initial construction, which will include classrooms, an administrative area, and an enclosed exterior play area for the children, will enable the Academy to open its doors in August 2013 for students in K3 (5-year-olds) and grades 1–3 (6–8 year olds). Student evaluations will begin in February 2013. Gouvieux, France, 27 September 2016 – His Highness the Aga Khan, Chairman of the Aga Khan Development Network (AKDN) and Rémy Rioux, Director-General of the French Development Agency (AFD), today presided over the signing of a loan agreement for US$25 million to finance the construction of the Aga Khan Academy Maputo. The agreement will expand provision of high quality education to develop future leaders and train teachers, supporting economic and social development in Mozambique. It will provide opportunities for talented girls and boys to access primary and secondary education, regardless of their socio-economic background. A unique talent identification system, as well as student scholarships, allows the Aga Khan Academy to offer a large number of students from lower income families the opportunity to access quality education. This loan, coupled with an investment of US$33 million by the AKDN, will enable the construction of the campus for the Aga Khan Academy Maputo, together with state-of-the-art infrastructure, facilities and equipment. In parallel, the construction of apartments for faculty and for rent will help support over $60 million of financial aid to be disbursed over the next 20 years. The student body of more than 750 girls and boys from kindergarten to grade 12 will benefit from facilities that will include classrooms, science laboratories, libraries, lecture and work-study rooms for teacher professional development, administration offices, students’ residences, dining and kitchen facilities, an amphitheatre, and sport and arts facilities. The campus will also be equipped with advanced IT infrastructure. “This project responds to AFD’s objectives for development in the education sector through pilot projects that aim for academic excellence, social inclusion and strategic partnerships with France. 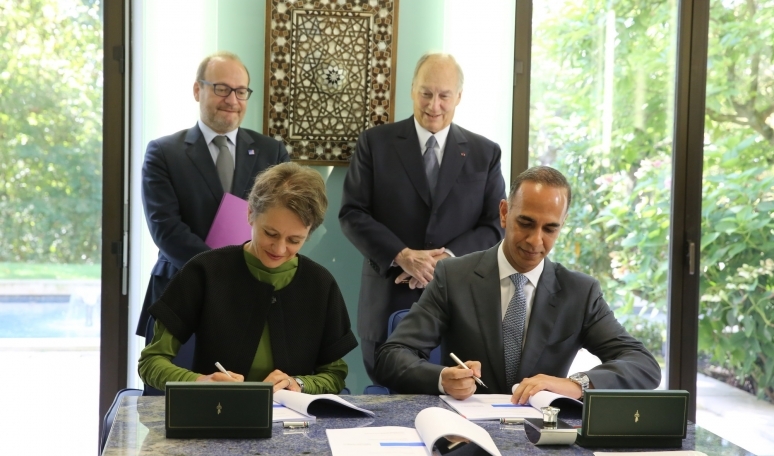 For AFD, this is the first financing agreement in the field of education with AKDN,” commented Laurence Breton-Moyet, Executive Director in Charge of Operations, who signed the agreement on behalf of AFD. “This project will lead the way to greater collaboration between the two organisations in education related projects, representing a new dimension to the partnership agreement signed between France and the AKDN on 9 December 2008. The Aga Khan Academies are very innovative; these schools are focused on educating future public, private and civil society leaders who can support the development of a democratic, tolerant and pluralistic society,” she went on to explain. A strong component of the Academy’s programme is its emphasis on the professional development of teachers from Mozambique and the region. Also under the agreement, the Aga Khan Academy Maputo will provide support to the national education system through training activities targeting teachers, school leaders, parents and professionals within the Ministry of Education. In addition, students will be bi-lingual or tri-lingual (English, Portuguese and French). Mhamud Charania, Chairman of the Aga Khan Education Services, Mozambique, signed the agreement on behalf of the AKDN. “AFD’s participation in this project confirms our belief in the value of investing significant resources in educating students with exceptional intellectual ability to the highest levels of achievement,” said Salim Bhatia, Director of Academies. “It is our intention to offer a distinctive, relevant and internationally validated education where girls and boys develop a strong sense of civic duty and capability to contribute to the improvement of the quality of life of their societies,” he added. The AFD, as France’s main agency for development, has developed a fruitful relationship with the AKDN on a number of projects. The two organisations have worked together for almost 20 years. Proparco (an affiliate of AFD focussing on the private sector) has mainly financed economic development projects (especially in the infrastructure, tourism and banking sectors), and AFD has focussed on social development projects in the areas of health, education and financial inclusion. Grégory Clemente, Director-General of Proparco, has equally committed to continue to develop projects with the Aga Khan Fund for Economic Development, in the energy sector in Africa and Asia, in tourism and in the financial sector. The French Development Agency and AKDN engage in a partnership to provide equitable access to an international standard of education in Mozambique. About the Aga Khan Academies: The Aga Khan Academy Maputo joins two sister schools in Mombasa, Kenya and Hyderabad, India as part of an integrated network of Academies being established by His Highness the Aga Khan across 14 countries. When complete, this multi-country learning community will include 14,000 students and 2000 teachers, and graduate 1400 students annually from all sectors of society. In addition to offering a high standard of primary and secondary education, each Academy provides professional development for educators from government and other not-for-profit schools to help improve educational standards. The Aga Khan Academy Maputo was delighted to receive a delegation comprised of members of the French Ministry of Education, the French Agency for Teaching Abroad, the French Embassy, the Director of the Gustave Eiffel Lycée and representatives the Aga Khan Development Network (AKDN) on 1 December 2016. 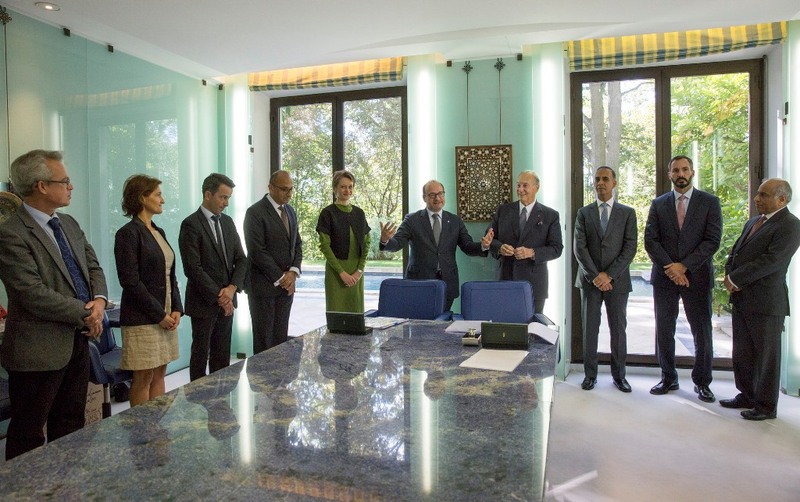 Earlier this year, His Highness the Aga Khan, Chairman of the AKDN, signed a loan agreement with the French Development Agency to finance the construction of the Aga Khan Academy Maputo. The students welcomed the guests into their classrooms and shared their learning experiences. The visit began with a welcome song by members of the Academy's French club. The visitors were able to see our curriculum in practice and hear about our development plans for the future. It was a very successful and enjoyable morning. Students at the Aga Khan Academy Maputo in Mozambique lead a tour of their school in English and Portuguese. The main purpose of the memorandum is to further explore the joint establishment of collaborative initiatives between the AKDN and the Ministry of Education and Human Development (MINEDH) towards national strategic objectives, as described in the national education strategy, particularly in the areas of student learning, teacher training, integration of information and communication technologies in teacher education, good governance and early childhood development. After the signing of the memorandum, the minister and delegation were given a guided tour of the facilities by the academy director and student, an opportunity to also learn about ongoing construction and the Academy’s Professional Development Centre programmes that are training and empowering Mozambican teachers.